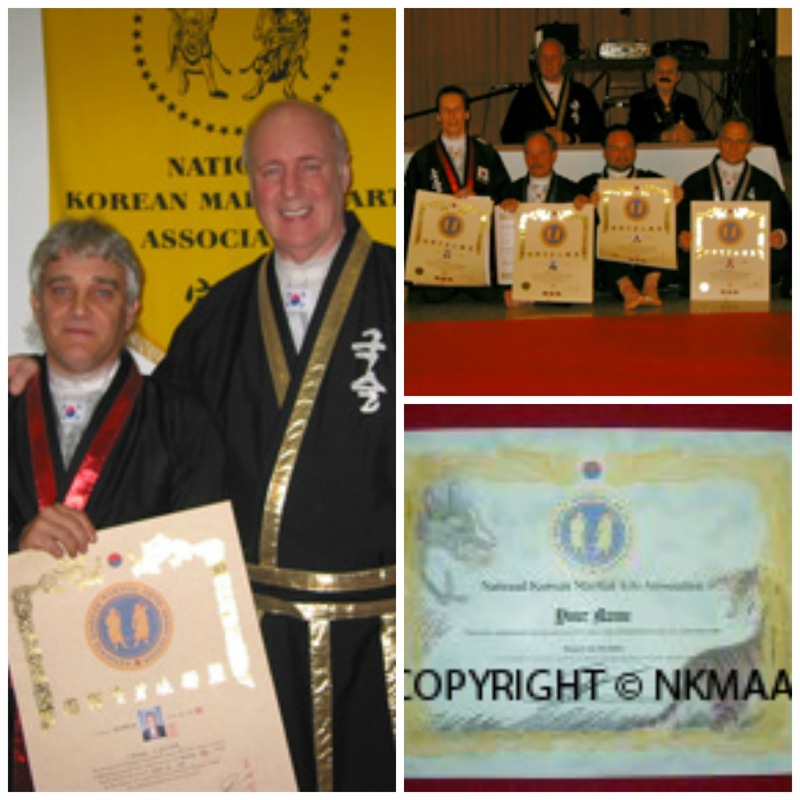 NKMAA Goods & Services offers items like Crests, T-Shirts, DVDs, training, and meaningful certification in Hap Ki Do, Kuk Sool, Tae Kwon Do, Tang Soo Do and most other Korean martial arts. Grandmaster Timmerman teaches only the art of Kuk Sool Hap Ki Do; however, our outstanding Board Of Advisors is ready to assist you with the other arts NKMAA offers. NKMAA is very fortunate to be aligned with some of the most respected Grandmasters of the various arts we love to share with our members. To learn more about these fine martial artists, please check out our Director stage or Masters Page. NKMAA offers several ways for students to advance in rank, and each is designed to fit your particular needs best. Some can take advantage of the training offered by our Directors or member schools. Others may wish to take advantage of our Long Distance Training Program, and they are as close to me as their computer and video camera. GM Timmerman values the proven method of “on the mat” old time blood and sweat training; however, he is progressive enough not to cling to ways that disregards today’s electronic opportunities. Hence, we offer video conferencing, video testing, DVD training aids and more through our NKMAA long distance training programs. KSHKD encompasses the entire Kuk Sool Hap Ki Do curriculum plus some hard style aspects of Korean martial arts not found in modern day Kuk Sool. Thus, it can be called a true Kwan Yu Sool (hard/soft) style martial art. The art is based on three distinctive traditional martial arts groups: Koong Joong Mu Sool (Royal Court Martial Art), Bul Kyo Mu Sool (Buddhist Martial Art), and Sado Mu Sool (Tribal or Family Martial Art). By employing the techniques developed by these three Korean martial arts groups, KSHKD practitioners learn blocking, striking, kicking, joint locks, falling, acrobatics, ancient weapons, Ki breathing techniques, and much more; in fact, the art is an entire SYSTEM employing the best Korean martial arts have to offer. Because it has such a vast curriculum, it takes the average practitioner about 4-5 or more years to earn a Black Belt; however, many students with past experience in other Korean arts, can be fast tracked. Either way, we believe that serious martial arts practitioners are not worried how long it takes to earn a Black Belt, as long as they continue to expand their knowledge. Since GM Timmerman personally looks after all KSHKD students, we can assure you that you’ll have enough material to last you a lifetime of serious study. You see… KSHKD does not stop at 5th dahn like most other martial arts, OUR system continues to teach new material all the way of to 8th dahn. 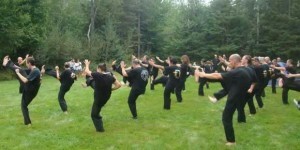 Learn all about our KSHKD by clicking Kuk Sool Hap Ki Do. We understand that some schools do not require a complete martial art; however, their current program may benefit from adding components such as: Grappling, Weapons, or even a small addition such as Falling, Kicking, or a simple self-defence program. Whatever your needs are, NKMAA has something to offer you. Check out the following examples. Our StickMasters program is an awesome opportunity for additional income for Instructors and School Owners. The program revolves around the “Ugly Stick” developed and handcrafted by Grandmaster Timmerman. The Ugly Stick is a devastating weapon for personal protection, and the Mini Stick is small enough to easily fit in your pocket, purse, and it can even used as a key chain. The slightly larger Dahn Bong and the Riot Stick all have the same features that make our Ugly Stick such a devastating weapon. Certified Instructors are encouraged to host their own seminars, in order to provide them with additional income. As a bonus, our StickMasters program includes Cane and Juhl Bong (nunchuck) techniques. To learn more about this awesome opportunity, click StickMasters International. The entire StickMasters program is available on DVD; and, as in all our long distance programs, Grand Master Timmerman will be happy to work with you via Facebook or Google hangouts. Some schools have great programs for “stand up” situations, but they lack material to prepare their students for the eventuality of “going to the ground”. For those schools, we have designed a training module that can help your students deal with that situation. This module is taught by Master Rick Tischer, who has an incredible arsenal of techniques to share with you. Master Tischer designed three modules of Grappling that will deal with just about every situation a student might encounter. To learn more, click Grappling Program. Many TKD schools do not presently have a “Personal Protection” program like Hap Ki Do, and GM Timmerman can help you design a customized Hap Ki Do program that will suit your needs. Kuk Sool, Kuk Sool Hap Ki Do, or Kong Shin Bup™ Hap Ki Do are ALL forms of Hap Ki Do, and each contains the devastating joint locks and kicks that Hap Ki Do is so famous for. Whatever suits you best, GM Timmerman can help you implement one of these great HKD programs in YOUR school. Through the National Korean Martial Arts Association, much like many respected Universities do, school owners and instructors of related Korean Martial Arts can be fast tracked, so they can quickly offer a complete Hap Ki Do program in their own schools. Through hands on training at seminars, videos, and video conferencing, our “Live Chat”, and a curriculum development to suit your needs, you can expand on the knowledge you already have and quickly implement a solid Hap Ki Do program. 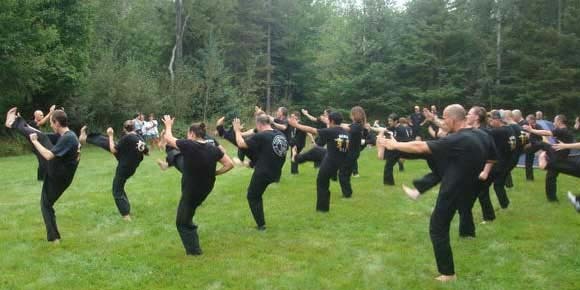 NKMAA offers some great hands on training opportunities, like our annual Warrior Weekend, also known as the NKMAA Summer Camp held at the NKMAA HQ every August. 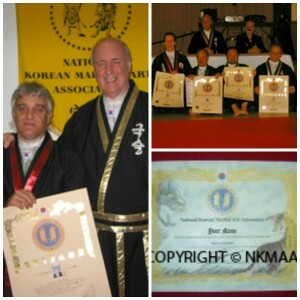 Since GM Timmerman is one of the two “Founding Fathers” of the Korean Martial Art Brotherhood, MKMAA members can also benefit from the many seminars offered by other members. One of the best known such events is the Korean Martial Arts Festival, hosted by NKMAA Director for the State of Florida – CM Thomas Gordon. Another great event you don’t want to miss is the annual Hap Ki Do summit, hosted by my dear friend, GM Kenneth McKenzie, in Voorhees New Jersey. If you are looking for Goods & Services or to get some mat time in, NKMAA provides the opportunity. The annual NKMAA Warrior Weekend, also known as the NKMAA Summer Camp, is a unique training opportunity where members camp at GM Timmerman’s home, or other suitable venue, for a three day weekend in August (watch for dates on our events calendar). There they set up their tents and train in a variety of Korean martial art activities just like old time outdoor training. For those who are ready, we offer an opportunity to test and be certified. Whenever the weather does not cooperate, the event is moved indoors to the Royal Canadian Legion Hall, where Grand Master Timmerman runs a nonprofit Hap Ki Do program with the help of a group of KJMS Black belts. Our NKMAA programs include awesome training at our annual Warrior Weekend, where you can train to your heart’s content, compete in our annual School Demo competition, enjoy our annual NKMAA Awards Banquet, AND network with some of the best in Korean martial arts… it just does not get any better than that. We love to share our arts without taking your last dollar. While the Warrior Weekend at GM Timmerman’s home IS roughing it, the event is much more than just a training opportunity. NKMAA Masters and students from all over the globe gather to share their skills, and one of THE most important aspects of the weekend is the camaraderie and story telling while roasting Marshmallows as we gather around the campfire. Students consistently report that much has been learned, while sitting around the campfires. 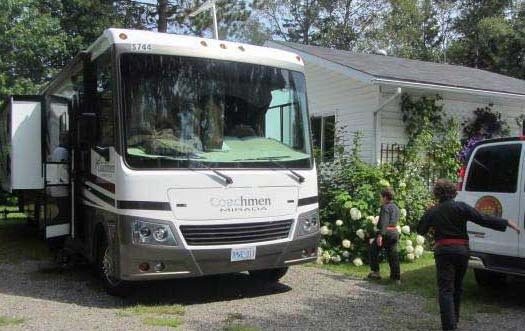 Left: The team from Holland rented a nice RV, and took advantage of their trip to Canada by exploring fantastic sites like the Niagara Falls and much more. Middle: Warrior Weekend participants practicing some kicking. Right: Kids practice staff training during their lunch break. In the back, you can see some of the tents participants set up. 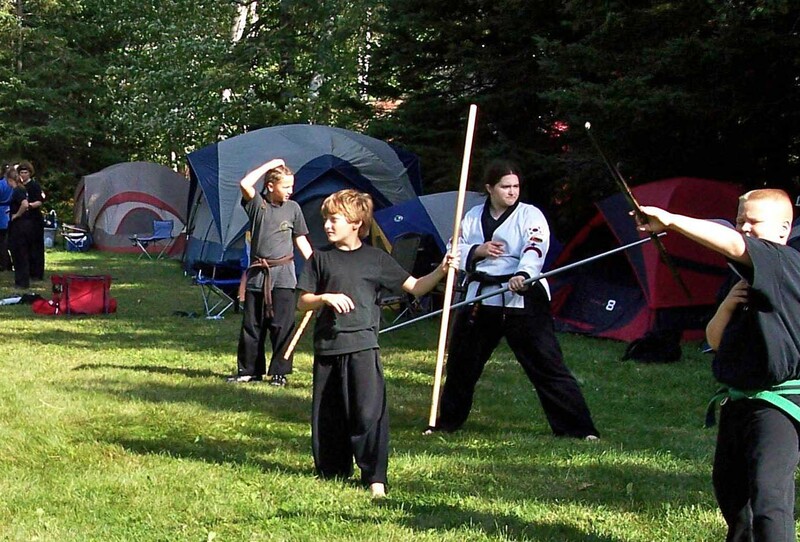 Because the NKMAA headquarters is near great beaches, campgrounds (or nice hotels for those who want to pamper themselves a bit more), camp participants often bring the entire family. Visitors from the US take advantage of the US dollar to make some very good buys, and Canadian hospitality is widely known. So… come up North, train to your heart’s content, and allow your family to enjoy a nice vacation with you. To see the complete line up of Goods & Services offered by NKMAA, please take your time to browse our site. If you like what you see, we encourage you to sign up to learn complete arts such as Kuk Sool, Hap Ki Do, or Kong Shin Bup. You can also take a look at one of our “components” such as: our StickMasters program, Sword, Staff, Fan, and Cane training, Grappling, and much more. When you stumbled onto the NKMAA website, you found the right place to advance YOUR martial arts career. Copyright © NKMAA 1973 - All Rights Reserved.